The first passenger aircraft to be made in Japan in nearly four decades was unveiled today as its manufacturer pushed into the booming regional jet sector with an eye to taking on industry giants Embraer and Bombardier. 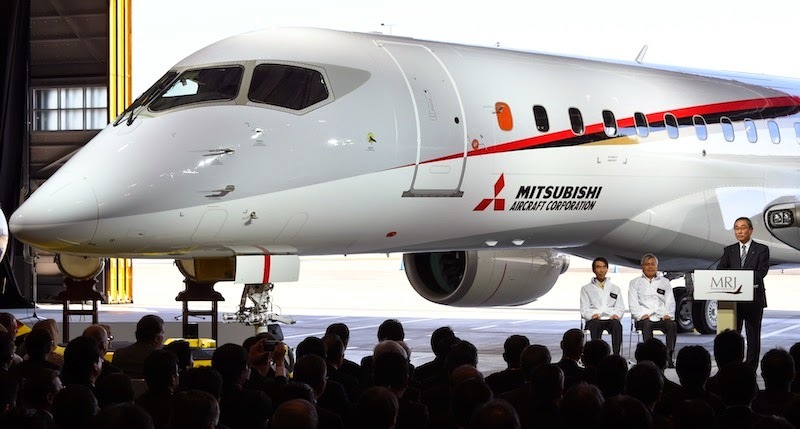 Mitsubishi Heavy Industries, a military contractor best known for its "Zero" World War II fighter, pulled back the curtain on its new Mitsubishi Regional Jet (MRJ), a fuel-efficient, next-generation aircraft that claims to offer more passenger comfort with lower operating costs. The jet, which will be delivered to customers from 2017 and was built with assistance from aviation giant Boeing, was unveiled at a ceremony in Komaki, near the central city of Nagoya, today. "The dream of a Japanese-made product that can be proudly presented to the world for top-notch efficiency and top-notch passenger comfort is finally coming true," said Mitsubishi Heavy Industries chairman Hideaki Omiya. "This wonderful aircraft that Japan has created after (a wait of) half a century carries with it many people's hopes and dreams." The plane marks a new chapter for Japan's aviation sector, which last built a commercial airliner in 1962 – the YS-11 turboprop. It was discontinued about a decade later. Teruaki Kawai, president and chief operating officer of Mitsubishi Aircraft, recently said that the plane boasted "state-of-the-art aerodynamic design, and a game-changing engine (that) will significantly cut fuel consumption, noise and emissions, helping airlines enhance competitiveness and profitability in the future". Japanese firms were banned from developing aircraft by US occupiers following its defeat in World War II. The country slowly started rebuilding its aviation industry in the 1950s, starting with carrying out repair work for the US military, before expanding its scope to start licensed production of US-developed aircraft for Japan's military. Japanese firms have also long supplied parts to Boeing. Mitsubishi's short-to-medium-haul regional jet, which comes in a 70- and 90-seat version, was backed by the Japanese government and a consortium of major firms including Toyota, with research and development costs of around ¥180 billion (RM5.6 billion). The company has secured 375 orders and options from carriers including All Nippon Airways (ANA), US-based Trans States Holdings, and SkyWest. Japan Airlines (JAL) has also signed a Letter of Intent for 32 MRJs, which have a list price of US$40 million (RM130 million), to be used on domestic flights. The MRJ project got off the ground in 2008 after ANA agreed to buy two dozen of the planes. But it quickly hit trouble as the global economic downturn battered the aviation industry, forcing many carriers to slash jobs and routes. The project took off again as Tokyo tried to lure more overseas visitors ahead of the 2020 summer Olympic Games in Tokyo. The Japanese government is also aiming to expand firms' foothold in the global aviation and military sectors as the domestic market shrinks due to a rapidly ageing population. The jet will compete with small aircraft produced by Brazil's Embraer and Canada's Bombardier, as well as jets designed by Russian and Chinese firms. Mitsubishi pointed to expected global demand of 5,000 regional jets over the next two decades. "Five thousand is not a small number," Kawai told the Wall Street Journal in an interview published this month. "I'm claiming we can get 50% of that. That's what we are aiming at right now. But in 20 years, I'm saying, not in three to five years, if our research is correct. We have to be ambitious. "For a long time, Japan has been successful in industries such as automobiles," he said. "It should last, but we need to find new industries. Aircraft manufacturing can be one of them." Automaker Honda is also developing a business jet, with its first delivery expected next year in North America and Europe. – AFP, October 18, 2014.